JJ over at Unrepentant Old Hippie has an excellent post about the sneering going on in some quarters at the passengers on the Greyhound bus where a young man was murdered this past week. They're all a bunch of "panzies" [sic], "pussies," etc., ad nauseam--the usual hyper-macho crap from the pimply and the weedy, safely hunting and pecking in their parents' basements. Well, not solely. Mark Steyn started all this nonsense by belittling the young men who were ordered out of a room at gunpoint by Marc Lepine at the Ecole Polytechnique. (That pompous buffoon would have filled his pants if he'd been there. He's even afraid of Human Rights Commissions.) Now every time we read of one of these horrific crimes, it seems, we get more armchair Rambos grunting about the girly-men who let this happen, and things would of bin diffrunt if somebuddy wuz carryin' a six-shooter, and our kulcher is gittin' feminized, blah, blah, fricken blah. Christ, I'm sick of this crap. Does it show? The killing in question was over almost as soon as it began. The guy kept slashing at a corpse. It was dark, and the murder happened at the very back of the bus. Work out the logistics of that, as Chet Scoville noted over at JJ's place. Instead of everyone somehow managing to rush to the back like heroes to rescue a dead man from an armed maniac, people helped each other get off the bus safely. Then the driver disabled the bus, and a posse armed with tire-irons and whatnot kept the killer confined in it until the RCMP showed up. Good grief, this was a textbook example of calm under fire. It makes me proud to be Canadian. Those people should be proud too. Things were done exactly right. 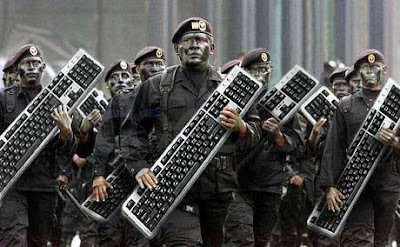 Next time, if there is any poetic justice in the world, I hope we can contrive to place two or three of these mega-macho computer warriors between the crazed killer and the normal folks. I'd pay to see that, so I would, but I suspect it would be a fairly brief piece of entertainment. Watching them flash their way to the front of the bus through a solid wall of other passengers, though: that would be memorable, wouldn't it? This page contains a single entry by Dr. Dawg published on August 2, 2008 2:00 PM. Book review: Am I Dead Yet? was the previous entry in this blog. Ramping up the fear! is the next entry in this blog.